Ugandan president Yoweri Museveni thinks it’s “a big shame” his country doesn’t have a national air carrier and is talking about creating one to make it easier and more affordable for his citizens to travel. For similar reasons, Nigeria’s president Muhammadu Buhari also talked about restarting a national airline shortly after coming into office last year. But, like their counterparts in Zambia and South Sudan, they’re both wrong if they think a carrier will soothe national pride or make travel easier for their countrymen and women. 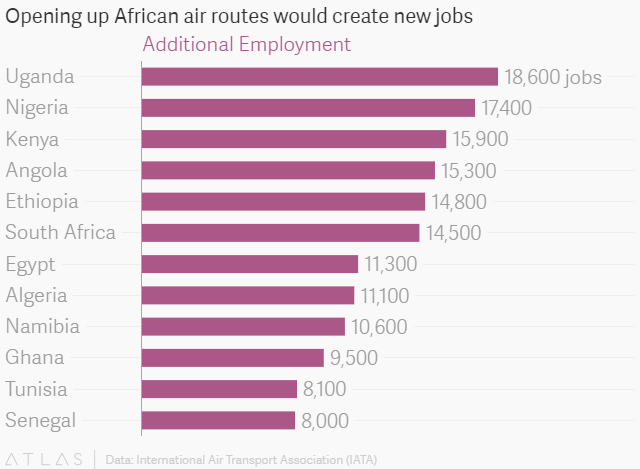 In fact, up to five million passengers a year are denied the opportunity to travel between African countries due to “unnecessary restrictions on establishing air routes,” says an International Air Transport Association (IATA) study. Opening up routes to airlines will mean implementing the Yamoussoukro Declaration (pdf), a 1999 agreement between African nations to open access to air routes on the continent. 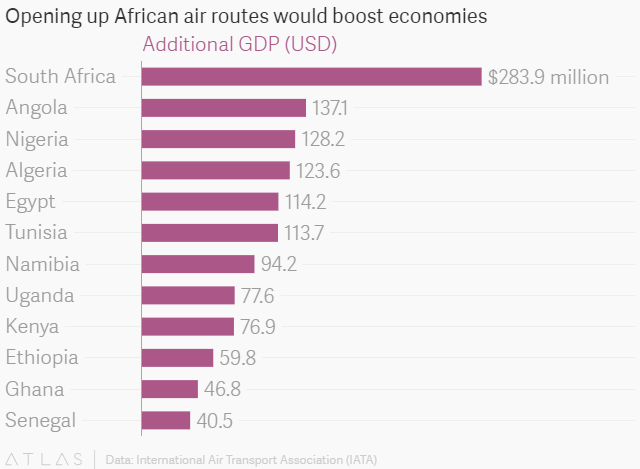 If this agreement had ever been followed through as it was intended, open air routes between the continent’s biggest markets would likely have impacted intra-African travel more than any national carriers could and without the billions of dollars in set-up costs. The biggest hurdle to opening up these routes is getting rid of high airport fees and local taxes which IATA says makes the continent unattractive for the airline industry. ”If you reduce airport taxes or charges, you tend to attract a lot more passenger traffic. More airlines would find it more competitive to come,” Raphael Kuuchi, IATA Vice President for Africa, says. These high taxes have also proven to be the bane of success of low cost airlines in Africa which, if successful, can “stimulate additional demand and come up with a new market segment,” says Kuuchi. One thing is clear, a new airline is not the best answer to cheaper travel. Several African national carriers have ended up in bankruptcy in the last decade or are racking up losses, like Kenya Airways. Buhari seems to have realized this and in March made clear that starting an airline was no longer a priority for Nigeria’s government.